Sabra Howard slept part of the night in her car and passed the rest of the time by reading a Bible study book. About 100 people slept in their cars overnight in the Red Bank High School parking lot waiting to receive medical care in Chattanooga, Tenn. Broken teeth are all too often a punchline in conversations about poor people in rural places. But for Heather Wallace, dental problems are anything but funny. "Basically it's just like a nerve pain. Your whole body locks up; you have to stop for a second to try to breathe," she said. "And sometimes if it hurts bad enough, you might cry." Wallace and her husband, James, are both in their 20s. In early June, they traveled a couple of hours from Knoxville, Tenn., to a free medical clinic in Chattanooga hosted by the nonprofit group Remote Area Medical. 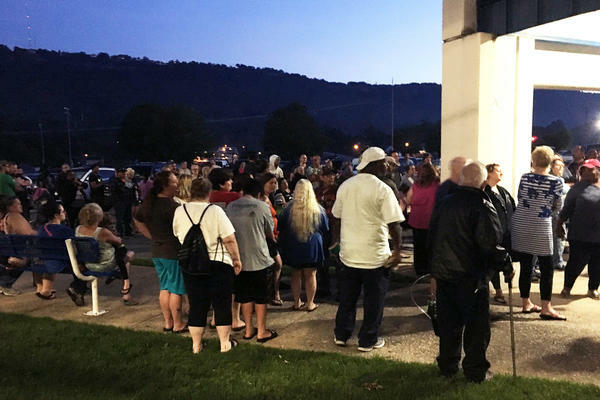 The Wallaces joined about 100 people camped out in their cars — and a few in tents — overnight to get a morning medical or dental visit. James Wallace earns about $9 an hour working in hotels, and he said Heather earns a little less. The job barely pays enough to cover groceries, he said, and doesn't come with health insurance or other benefits like dental care. "We don't have it; we can't afford it, and we don't make enough to be penalized at the end of the year so either which way it goes we don't have the money to pay for it," he said. Under the Affordable Care Act, millions more Americans now have insurance through online exchanges and Medicaid. But like the Wallaces, many still lack coverage, especially in states like Tennessee, where elected leaders declined to expand Medicaid. The Wallaces were camped out on a blanket outside Red Bank High School in Chattanooga on a Friday afternoon, the day before the clinic was set to open Saturday morning. They said they make too much money for Medicaid, and they looked into an ACA exchange plan but couldn't afford the premiums. President Trump has promised to replace the ACA, also known as Obamacare, with something better. But the Congressional Budget Office estimates a plan passed by the House of Representatives would leave 23 million more Americans uninsured, and Senate Republicans have yet to reveal the details of their plan. Amid debates about health policy, RAM has for decades put on these clinics serving low-income people around the country. It now holds dozens each year. Founder and President Stan Brock said most patients lack dental or vision coverage, and those who have some kind of health insurance often can't afford their copays and deductibles. "That is something that we hear all the time — it's costing me so much money before my insurance kicks in," Brock said. Heather Wallace said Obamacare "was not what they said it was gonna be," and suggests that maybe the United States should move to a system like Canada's, where everyone is covered by single-payer government program. "Make it to where everybody can have health insurance, and they'd have more productive members of society and maybe drop the percentage of Americans on food stamps," he said. But both say they have low expectations for any major changes from Washington. Neither voted in the 2016 election, though James Wallace said he likes the way Trump speaks his mind. Sabra Howard, 55, voted for Trump because she wanted change, and she hopes he can follow through on his campaign promises. "I just want him to sit down and talk with, you know, the people smarter than me and come up with a good plan that will help everybody," she said. Howard was among scores of people who slept in their cars overnight in the high school parking lots waiting to receive medical care. She lives just outside Chattanooga and has a few chronic health issues, but her most pressing concern is her teeth. Over the years, she said she prioritized her children's dental care over her own. She has gradually lost all of her upper teeth and has learned not to smile so that people don't notice. At the clinic, she received a teeth cleaning and met with a physician assistant to talk over her health issues and update her medication. "I think I probably still [smile] every once in awhile, I'm sure, but intentionally? No. You take a picture, you don't open your mouth all the way," she said. Howard has also trained herself not to lisp when she talks on the phone for her work-from-home customer service job. She said she loves the work, but she doesn't receive benefits because she is a temporary employee. Her dental problems have compounded her financial struggles; she said she turned down an opportunity to sell insurance because of them. "I felt like, you know, I'd be sitting there talking to a client, and next thing I know, they realize I don't have teeth," she said. "And who wants to buy insurance from somebody that, you know, don't have any teeth?" Howard has mixed feelings about government involvement in health care, and she worries about people taking advantage of benefits. But she said too many people are struggling to afford care. "I don't really think government should be all in it, but I think that a lot of people need someone to speak for them," she said. Howard says she just wants to be able to take care of herself; she's trying get a position with benefits. Until then, she's hoping to get dentures at another free clinic, on another day. Here's one big reason that Democrats and many Republicans express doubts about repealing the Affordable Care Act - the law allows states to expand their Medicaid coverage - many did, and millions of people received coverage. A proposed Republican replacement would take hundreds of billions of dollars out of Medicaid, making it unclear how the coverage would change in state after state. To understand what it all means, it helps to visit a state that never expanded Medicaid in the first place to see what happens there. NPR's Sarah McCammon traveled to Tennessee. SARAH MCCAMMON, BYLINE: Missing teeth are all too often a punchline in conversations about poor people in rural places. But when your teeth need attention, it's not funny. HEATHER WALLACE: Basically, it's just like a nerve pain. Your whole body locks up, it - you have to stop for a second to try to breathe. And sometimes, if it hurts bad enough, you might cry (laughter). MCCAMMON: That's Heather Wallace. She and her husband James are both in their 20s. They traveled about two hours from Knoxville, Tenn., to a free medical clinic in Chattanooga earlier this month. James Wallace says they each earn around $8 or $9 an hour working in hotels. Health insurance and dental care aren't part of the deal. JAMES WALLACE: We don't have it. We can't afford it. And we don't make enough to be penalized at the end of the year. So either which way it goes, we don't have the money to pay for it. MCCAMMON: The Wallaces were camped out on a blanket outside Red Bank High School in Chattanooga on a Friday afternoon, hours before the clinic was set to open Saturday morning. The nonprofit group Remote Area Medical puts on dozens of these clinics around the country each year. Founder and President Stan Brock says even under the ACA, many of these patients still lack health insurance, let alone dental and vision. Those who have some kind of insurance often can't afford the co-pays and deductibles. STAN BROCK: That is something that we hear all the time. It's costing me so much money before my insurance kicks in. MCCAMMON: The Wallaces say they make too much money for Medicaid. And they looked into an Obamacare exchange plan but couldn't afford the premiums. H. WALLACE: Obamacare was not what they said it was going to be. MCCAMMON: Heather Wallace says maybe we should have a system like Canada, where everyone is covered. James Wallace agrees. J. WALLACE: ...And maybe drop the percentage of Americans on food stamps. MCCAMMON: During the campaign, President Trump often promised to replace the ACA with something much better. But the Congressional Budget Office estimates a plan passed by the House of Representatives would leave 23 million more Americans uninsured. And Senate Republicans have not revealed the details of their plan. 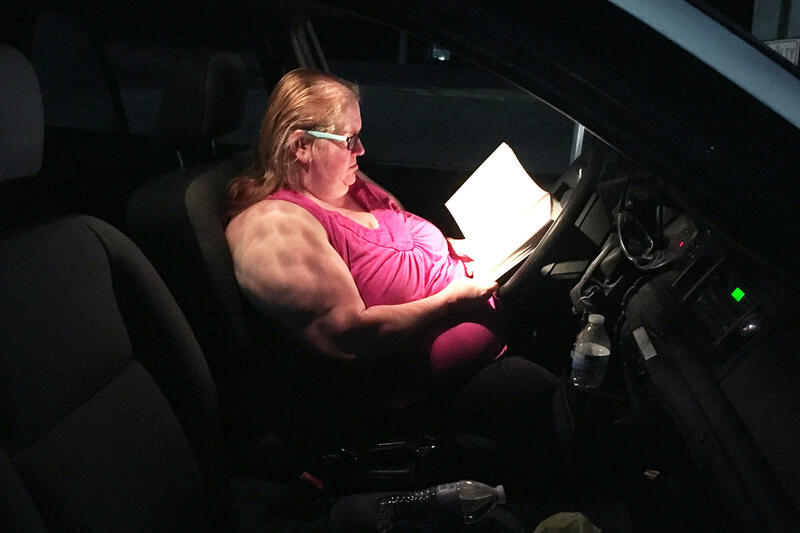 On Saturday morning, after a long night spent reading and trying to doze off in the car, 55-year-old Sabra Howard finally got to see a dentist. She has several health issues, but she's most concerned about her teeth. UNIDENTIFIED MAN: Sabra, what brings you over today? SABRA HOWARD: I wanted to see about cleaning and any fillings that I may need. HOWARD: I don't have any top teeth anymore. I just have bottom. MCCAMMON: Howard, who lives just outside Chattanooga, loves her work-from-home customer service job, but it doesn't offer benefits. And she can't afford the premiums for plans offered through the exchange. She says she voted for Trump. HOWARD: Well, I wanted change. MCCAMMON: And she hopes he can follow through on his promise to reform the health care system, though she's not sure about the details. HOWARD: I just want him to sit down and talk with, you know, the people that are smarter than me and come up with a good plan that will help everybody. MCCAMMON: You seem pretty smart. What do you think - what do you want to do? I mean, do you think that there should be more government support for it, or is there some other parts that you think would be better? HOWARD: I don't really think government should be all in it, but I think that a lot of people need someone to speak for them. MCCAMMON: Howard says she just wants to be able to take care of herself. She spent years prioritizing her children's care over her own, and now her dental problems are compounding her financial difficulties. HOWARD: I actually have my insurance license. And I passed up an opportunity to go ahead and do that because of my teeth because I felt like, you know, I'd be sitting there talking to a client. And next thing I know, they realize I don't have teeth. And who wants to buy insurance from somebody that, you know, don't have any teeth? MCCAMMON: Howard says she's working toward getting a position with benefits. In the meantime, she's hoping to get dentures at another free clinic on another day. Sarah McCammon, NPR News, Chattanooga. Transcript provided by NPR, Copyright NPR.